A meeting was held on 18th February 1851 at which the six parishes of Dornock, Half Morton, Hoddom, Graitney (Gretna), Kirkpatrick Fleming and Middlebie discussed the building of a combination poorhouse. Initially, a site was offered by Sir John Heron-Maxwell, but this fell through due to legal complications, and a site was provided by Matthew Rae of Newton. The building was scheduled for opening on 1st July, 1853. The architect was John Hodgson of Carlisle. Its location and layout are shown on the 1862 map below. 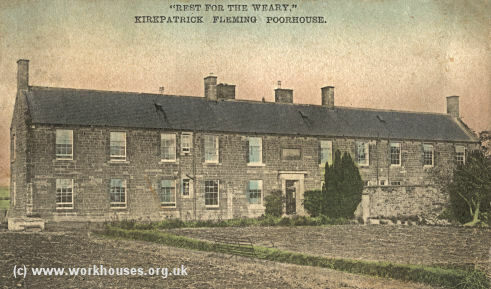 Kirkpatrick Fleming poorhouse from the south-west, c.1910. The building was a T-shaped design and was intended to accommodate up to 120 inmates. The main part of the building was two storeys high. An entrance lobby gave admittance to the master's rooms, together with separate entrance's to the male quarters on the left, and women's on the right. The leg of the T at the rear contained a dining-room which was also used as a chapel, and because of a slope in the ground contained an basement floor. On the men's side, the basement comprised a reception room with two baths, store-room, stick house, and men's day room. On the women's side were kitchen, larder, scullery and ironing room. Other outbuildings included ash pit, wood store, and straw shed which stored straw used for stuffing the inmates' palliases. In each of the inmates' yards was an unpartitioned three-seater latrine. The first floor contained dormitories and a sick room. In 1922, the Combination appears to have been renamed the Notwen Combination. In 1932, the poorhouse became Notwen House. 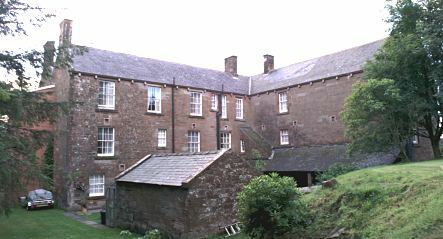 The site continued to provide council-run accommodation until the 1960s, then became a residential home for the elderly. In addition to its participation in the Combination, the 1881 census indicates that the parish of Hoddom (or Hoddam) had its own "Council Sick Poor House". The establishment, presumably run by the parochial board as short-term accommodation for sick paupers, was located at the southern end of Ecclefechan. Dumfries and Galloway Archives, 33 Burns Street, Dumfries DG1 2PS, Scotland. Holdings include: Kirkpatrick-Fleming Combination Poorhouse Board minutes (1851-1922); Notwen Combination Poorhouse, minutes (1922-30); Notwen House clothing stock book (1932-1949); Abstracts of accounts (1917-21, 1925-28); Register of poor (1871-1930); Register of applications (1929-30). Adamson, Duncan (1986) Kirkpatrick Fleming poorhouse: the first ten years in Transactions of the Dumfriesshire and Galloway Natural History and Antiquarian Society, 61, 103.